Super-Fast Thermapen is, without a doubt, the best food thermometer available and an essential really cool kitchen tool. Sure, it’s way expensive, but sometimes it makes sense to just buy the best. The thing that sets this apart from all other kitchen thermometers (and there are some pretty good ones out there) is its speed, accuracy and ease of use…it takes just 3 seconds to register an amazingly accurate reading. 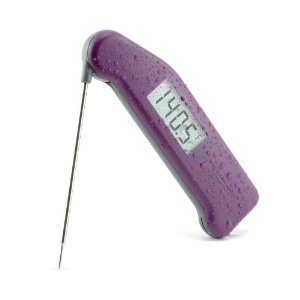 Another great feature is that the Thermapen is splash-proof, with molded-in seals that protect the thermometer from wet hands and kitchen splashes. I also love the way it operates…just open it and it turns on and close it and it turns off…no buttons, cables, slides or switches (and it comes in some really great colors!). When buying things for the kitchen, I always take pricing into account, but I believe that in this case, because a great thermometer invariably leads to great results when cooking, if you can afford it, it pays to go with the best. This also is absolutely one of the coolest gifts you can buy for someone who cooks…they’ll use it and love you forever! Cheesecake Lollipops – A Dessert to Impress Your Friends!